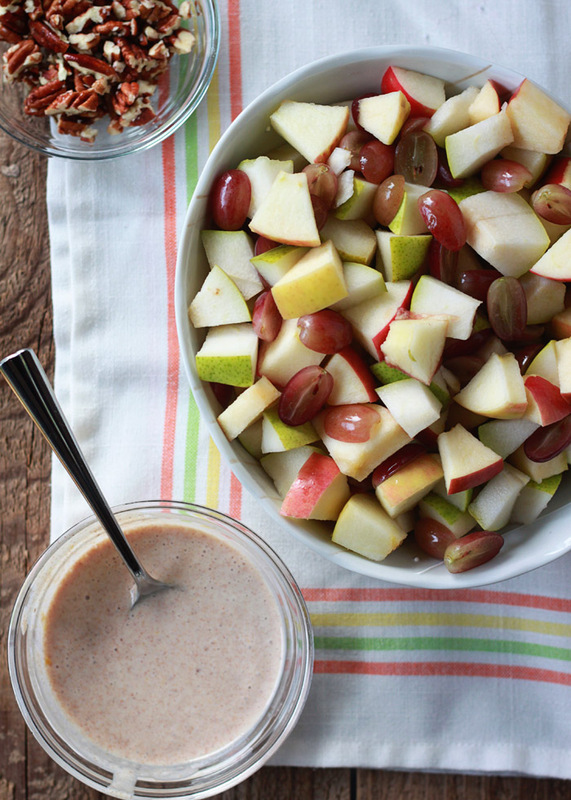 Crisp apples, sweet pears, and juicy grapes combined with sweet-spiced, creamy dressing â€“ and then sprinkled with a few chopped pecans for crunch. Oh, happy harvest! Place pears, apples, and grapes in a large bowl. Toss gently to combine. Set aside. To a small bowl, add the yogurt, lemon zest, lemon juice, maple syrup, vanilla, cinnamon, and nutmeg. Use a wire whisk to blend well. Drizzle dressing over the fruit. Toss gently until fruit is coated. Scoop into bowls and sprinkle with pecans. Serve immediately.